Replacement Covers for Brooks Mark II and Mark II Junior Series Fire Extingusiher Cabinets. 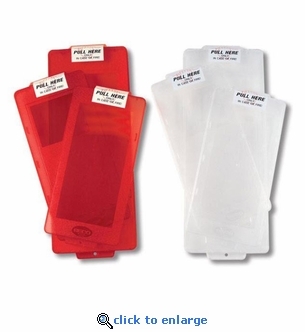 The Mark II replacement covers come in translucent red or clear. The covers can be removed without breaking them by removing the padlock at the bottom. M2JC - Clear - Mark II Jr. Replacement Cover - 23" x 10 3/16" - $15.95 ea. M2JCR - Red - Mark II Jr. Replacement Cover - 23" x 10 3/16" - $17.45 ea. M2C - Clear - Mark II Replacement Cover - 27" x 10 3/16" - $18.25 ea. M2CR - Red - Mark II Replacement Cover - 27" x 10 3/16" - $18.95 ea. Covers also available for Mark I and Mark I Junior Cabinets. Please call.